Unlike The Lick Drawings, through the large scale that alludes to the cinematic, The Big Lick is a confrontation with the cinematic screen, going up to it and rupturing it, and at the same time asking the audience to do the same. It fragments the still image, that is already just a section of the film, into a picture so large that it practically cannot be seen as a whole, further fragmenting the frame and the film itself. Another layer of fragmentation occurs when the work is being licked. 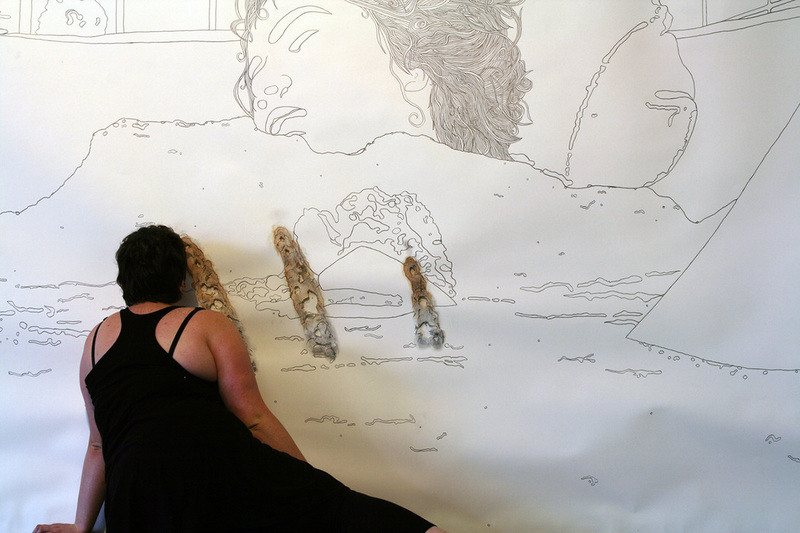 As I move around the image, my body hides parts of the drawing and the audience has to move around the gallery to experience the action, evoking a bodily reaction in space - the moving audience subverts the traditional cinematic experience and simultaneously suggests an inter-subjective relationship between the body of the artist and the viewer. The Big Lick develops a space that transgresses the fetishistic investment in the image of the feminine in cinema, fragments narrative, and subsequently attempts to reposition the female body away from being the object of the Gaze.